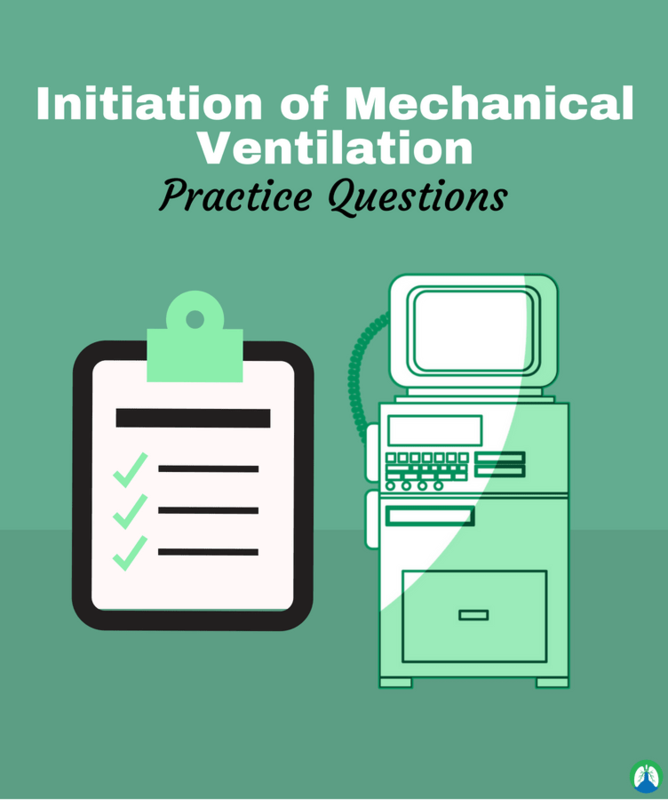 This post contains some very useful practice questions for the initiation of mechanical ventilation. Ready to learn about the initiation of mechanical ventilation? I sure hope so because below, we’ve compiled some of the absolute best practice questions that will teach you the ins and outs of how to initiate invasive mechanical ventilation on a patient in need of ventilatory support. So are you ready? Let’s dive into the practice questions below. 1. When initiating mechanical ventilation, what mode should you choose? The mode doesn’t matter as long as you can set a respiratory rate for the patient. Any mode is acceptable for initiating mechanical ventilation. 4. What are the 4 methods of full ventilatory support? 5. What two settings on the ventilator allow you to manage the patient’s CO2? 6. What should the initial setting for respiratory rate be for a new mechanical ventilation patient? 7. What should the initial setting for tidal volume be for a new mechanical ventilation patient? 8. What should the initial setting for pressure be for a new mechanical ventilation patient? 9. What should the initial setting for FiO2 be for a new mechanical ventilation patient? 10. What should the initial setting for PEEP be for a new mechanical ventilation patient? 11. Spontaneous tidal volume is driven by _____________ and should not be considered on the initiation of mechanical ventilation. 12. What two options on the ventilator allow you to manage the patient’s O2 (SaO2)? 13. Which patients should be set at 40% FiO2 on initiation of mechanical ventilation? 14. Which patients should be started at an FiO2 of 100% on the initiation of mechanical ventilation? 15. What is the FiO2 exception rule for initiating mechanical ventilation? 16. All patients being set up on mechanical ventilation must have what done? 17. What should the tidal volume alarm be set at? 18. What should the respiratory rate alarm be set at? 19. What should the minute ventilation alarm be set at? 20. What should the PIP alarm be set at? 21. What should the plateau pressure alarm be set at? 22. What are some indications for mechanical ventilation? 23. What constitutes acute ventilatory failure? 24. For a patient with a NIF or MIP of less than 20 cmH2O, you should do what in this situation? 25. What is the criteria for impending respiratory failure? 26. What is an absolute contraindication for initiating mechanical ventilation? 27. Why would you initially set tidal volumes lower than 8-12 mL/kg of ideal body weight? 28. What type of ventilation only supports spontaneous breathing and is not needed during the initiation of mechanical ventilation? 29. What two things should you monitor when using PEEP? 30. Why would you increase PEEP? 31. What is the most common method of I:E change? 32. Changes in respiratory rate affect the length of what? 33. Complications of mechanical ventilation include? 34. What causes mechanical ventilation failure? 35. What is the other data that may collectively indicate the need for mechanical ventilation? 36. In adults, what are the 9 things needed for the initiation of mechanical ventilation? (1) Rate. (2) Vt. (3) FiO2. (4) PEEP. (5) Mode. (6) Peak Flow. (7) Ideal body weight. (8) Best type of ventilator. (9) Complications associated with positive pressure ventilation. 37. What is the normal FiO2 to initiate mechanical ventilation for an adult? Use the same FiO2 as the previous if it available. Don’t put the patient on room air (21%). Use 30 – 60% if the previous FIO2 is not known or if they were on room air. Initiate with an FiO2 of 100% if it’s an emergency situation. 38. What is the normal PEEP to initiate mechanical ventilation for an adult patient? For PEEP, you should use the same as previous (CPAP values/the expiratory side of BIPAP). Or if no previous PEEP then any PEEP under 10 cmH20 is ok.
39. What is the normal mode that should be used to initiate mechanical ventilation on an adult patient? Any mode is acceptable for initiating mechanical ventilation. All modes will ventilate. 40 What is the normal peak flow to initiate mechanical ventilation on an adult patient? For peak flow, you must calculate the appropriate flow. 41. What is the normal ideal body weight to initiate mechanical ventilation on an adult patient? 42. When initiating mechanical ventilation, when should you use a volume-cycled ventilator? If there is any problem with the lungs. For example; ARDS, pneumonia , COPD etc. 43. When initiating mechanical ventilation, when should you use a pressure-cycled ventilator? If there is any problem other than with the lungs, that’s when you should use a pressure-cycled ventilator. For example; neurological cases, drug overdose, myasthenia gravis, etc. 44. What are the complications associated with positive pressure ventilation to initiate a mechanical ventilation? Decreased venous return, decreased urine output, loss of dignity, development of ventilator dependency. 45. How do you monitor a patient receiving mechanical ventilation? (1) Maintain the vital function of ventilation, (2) Oxygenation and ventilation requires the need to monitor its clinical and lab areas, (3) Watch for a decrease in cardiac function (4) Changes in blood pressure needs to be monitored. 46. What are the central objectives for a patient on mechanical ventilation? 47. How do you monitor the readiness to wean or to stop mechanical ventilation? The patient may be ready to ready to wean if: (1) All vital signs are stable, (2) ABGs are good, (3) Their spontaneous tidal volume is > 5 mL/kg, (4) Their vital capacity is > 10 mL/kg, Their MIP is > 20 cmH20, (6) the QS/QT is < 20%, (7) the Vd/VT is < 60%, (8) The underlying problem has been resolved. 48. What are the 7 Ventilator Modes? 49. What is SIMV/IMV mode? It is good for weaning, and also good for patients who breathe on their own to a small degree. This mode offers a less likelihood of barotrauma. Be sure to avoid hyperventilation. It is often used on anxious patients until sedation wears off, then a control mode can be used. It consists of a mandatory rate and also allows spontaneous breathing in between the mandatory breaths. 50. What is Assist/Control mode? It provides a set tidal volume at a set rate. Also, the set tidal volume is delivered even when the patient spontaneously initiates breaths above the set rate. It’s a good mode and works with most patients. Alert patients tend to find it uncomfortable and may need sedation and anxiety controlling medications. 51. What is Control mode? It is used for unconscious patients. It does not allow patients to determine the rate or tidal volume. For this mode, patients should be sedated or paralyzed. This mode is not common but will provide ventilation just as good as any other mode. 52. What is Pressure Control Ventilation (PCV) mode? It is used when peak pressures are a primary concern above 50 cmH2O by volume ventilation. There is no tidal volume setting; only inspiratory pressure and inspiratory time. You must set exhaled tidal volume alarms. It is a good mode for high PIP and for hypoxemia patients. It is not a good initial ventilator mode. 53. What is Inverse Positive Pressure Ventilation (IPPV)? It’s not a good initial mode. It can be used on the same patients as those eligible for pressure control ventilation (ARDS). It may be useful for patients requiring high peak pressures due to low lung compliance. 54. What is Inspiratory Plateau mode? It helps to improve gas distribution. Also, it can significantly increase mean airway pressure. 55. What is the High-Frequency Ventilation (HFPPV) mode? Includes a rate at a high frequency. The main controls are drive pressure, inspiratory time, rate, injector line, PEEP, and FiO2. You can use the drive pressure, rate, and %IT to change ventilation. 56. HFPPV Is used on what patients? 57. What are the ventilator controls that affect the patient’s PaCO2? 58. What should we do if PaCO2 is between 35 – 45mmHg, which is the normal range? 59. What should you do if PaCO2 is high? 60. What should you do if PaCO2 is low? First, add deadspace if PCO2 is only off by 1 point. Second, you should decrease the rate. Third, you should decrease the tidal volume, but stay in normal range. 61. What should you do if PaO2 is low? You should raise the FiO2 by 5 – 10% until you reach 60%. Then you can raise the PEEP level by 5 cmH2O. If PEEP gets very high (above 20 cmH2O) be sure to monitor the patient’s hemodynamics and cardiac output. If the cardiac output falls, then you should lower the PEEP to the last previous value and begin raising FiO2 if hypoxemia persists. 61. What should you do if PaO2 is high? You should decrease the FiO2 until it’s below 60%, then begin lowering the PEEP. If the FiO2 is 60% or below, then immediately focus on the PEEP. You should decrease the PEEP by decrements of 5 cmH2O. Then you can move the FiO2 by 5 – 10% at a time. 62. What does it mean to add Pressure support? Pressure support helps to overcome the resistance of the circuit tubing during spontaneous breathing. Pressure support helps spontaneous breathing patients accomplish larger tidal volumes. It also helps to wean patient and keep their tidal volume above 5 mL/kg. 63. What are the two types of ventilator alarms? 64. During an intubation for a patient that needs full ventilatory support, what are the three medications that should be given to this patient? 65. If the patient is under full ventilatory support, in order to relieve pain and anxiety, what are the three medications that should be given? 66. While in full ventilatory support, how should you position the patient? 67. What are the most common diagnoses requiring mechanical ventilatory support? Acute respiratory failure, COPD exacerbation, coma, and neuromuscular disease. 68. A brief inspiratory hold may improve what? The distribution of ventilation and oxygenation. 69. Lung injury is caused by? It is caused by repetitive opening and closing of unstable lung units. PEEP stabilizes in the open position reducing the likelihood of injury.